When I wake up in the dark hours of the morning, it is the thought of that steamy hot cup of tea that gently coaxes my feet out from the covers and onto the floor. If I hurry, I can take my first sip, in silence, before the mayhem starts. It’s not that the boys are boisterous in the morning — they’re actually pretty quiet, at first. The little ones come downstairs and hide under their blankets over the hot registers, while the older ones are content to stay in bed. I’m the one who makes all the nosie. Soon, I’ll have to start — breaking that silence, and begin all of that endless prodding. 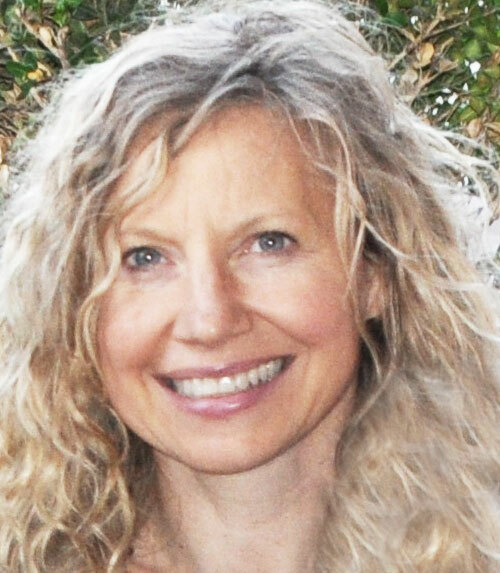 It goes something like this — Get up, brush your teeth, have you combed your hair? Everything times 4, then, times 3, for the first two times they didn’t listen. Lately, no one feels like eating! OK — I know it’s rush-hour, and my primary objective should be, to get the kids out of the door and to school on time — but I’m still thinking about nutrition — even at this early hour of the day. After all, isn’t breakfast the most important meal of the day?! My challenge has always been to find a portable healthy breakfast, full of protein and healthy carbs. 2. Fun-Size, the ten-year-old vegetarian who thinks food is for “picking,” not eating. He leaves a trail of dried oatmeal behind him, as he eats it by the handfuls, straight from the cardboard barrel. 3. The 13-year old who has made a lifetime commitment to PB&J. 4. Our oldest son — a growing “man” of 17, who is already starving by the time he wakes up, who will not touch eggs or PB&J. He is now taking weight training for his first period class. He MUST HAVE a quick source of protein along with a good dose of healthy carbs. “Cereal just doesn’t fill me up,” he says. Heaven help me if I forgot to switch on the dishwasher the night before. I wish I could say that I found a one-size-fit-all morning solutions. Instead, I’ve developed an “arsenal” of quick breakfast meals that I make ahead, and keep stocked. 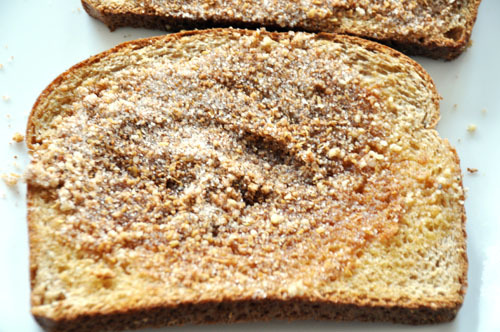 One of our favorite, and easiest, go-to breakfasts is pumped up cinnamon toast. This is a far cry from the cinnamon and sugar we ate as kids. This one is full of healthy protein and Omega 3s. It’s sugar-free, and cinnamon is good for regulating blood sugar. How do you get Omega 3s in cinnamon toast? Great question: flaxseeds. For me, all the major nutrition bases are covered through this cinnamon power powder. 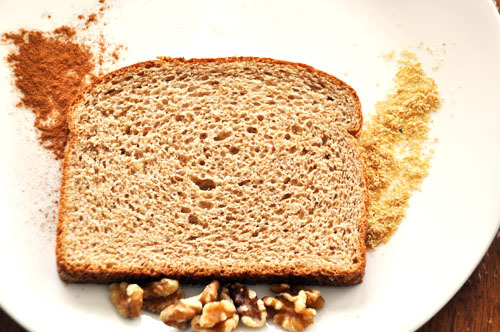 If all the boys have time to eat is a slice of toast with this cinnamon powder, I feel good about that! 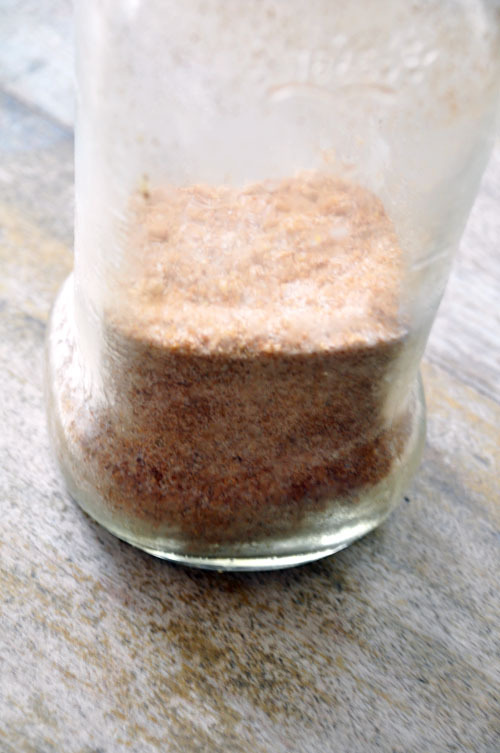 I mix up this cinnamon powder in batches, and store it in a glass jar in the freezer. • 1/2 cup Stevia — more or less to your taste. To make it, grind the nuts and flaxseed in a food processor or coffee grinder. Depending on how picky your kids are about “texture” will determine how “fine” you make your powder. Pour the nuts and flaxseeds in a large mason jar and add the cinnamon and Stevia. Shake well. Store in the freezer — flaxseed must be kept cold. Sprinkle on the cinnamon power powder, and go.